The Juicer embed code automatically includes jQuery. On some websites, this can cause problems elsewhere on the page where you insert the Juicer code. Oftentimes, it's navigation menus that are affected. Try the above, then clear your browser cache and see if the problem has been addressed. 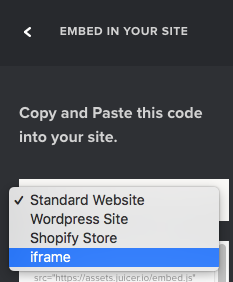 If not, it's best if you can send the URL of your webpage to us via Intercom or to [email protected], with the original Juicer code still included on the page. Just keep in mind that the iframe version of Juicer does not have responsive design or the post overlay (pop-up) feature.